The Original Dreamie is the “Why didn’t I think of that Invention of the Year”. 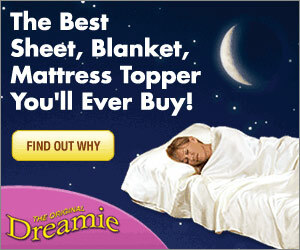 Now you can have soft comfortable bedding no matter where you lounge or sleep. Dreamie has a built in Pillow pocket so that Pillow never slips away and is perfect for travelers who want to bring their own bedding with them. DREAMIE is light and fits in any travel bag. With Dreamie, you’ll have silky soft, comfortable and clean sheets wherever you sleep. Dreamie is perfect for house guests, sleep overs, college students and traveling for that person on the go. Free Carrying Case included with your order today. Buy 1 today and get 1 more free!